The exotic tick Haemophysalis longicornis has surfaced again in Hunterdon County. 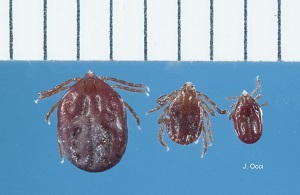 More infomration about this curious, parthenogenic tick can be found on the news tab on Dina Fonseca’s lab website and in particular on the research page: https://fonseca-lab.com/research/global-health-the-tick-that-binds-us-all/ . Stay tuned for further developments! This entry was posted in Uncategorized and tagged exotic tick, Haemophysalis longicornis on April 23, 2018 by Lisa Reed.